For other uses, see Huy (disambiguation). 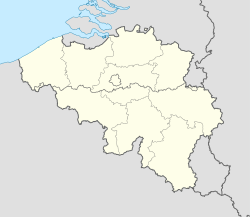 Huy (pronounced [ɥi]; Dutch: Hoei; Walloon: Hu) is a municipality of Belgium. It lies in the country's Walloon Region and Province of Liege. Huy lies along the river Meuse, at the mouth of the small river Hoyoux. It is in the sillon industriel, the former industrial backbone of Wallonia, home to about two-thirds of the Walloon population. The Huy municipality includes the sub-municipalities of Ben-Ahin, Neuville-sous-Huy, and Tihange. The first village originated around the Roman castrum, an early fortress located on the right bank of the River Meuse. The village was evangelized by Saint Domitian, bishop of Tongeren in the 6th century and the town is mentioned for the first time in a 7th-century testament (as Hoius vicus, taking its name from the river Hoyoux). In the early Middle Ages, Huy was one of the most prosperous cities on the Meuse, with a flourishing economy based mostly on metallurgy, but also on tanning, sculpting, woodworking, and wine-making. In the 10th century, Huy was promoted to county status, but soon became part of the Prince-Bishopric of Liège, with which it would share its history for more than eight centuries. Huy was the recipient of the first historically known charter north of the Alps, confirming it as a city in 1066. It is around that time that Peter the Hermit harangued the locals and persuaded them to participate in the First Crusade. In the 13th and 14th centuries, the economy boomed thanks to the cloth industry. The castle on a hill right in the middle of town, was used in times of war and strengthened accordingly. By the 15th century, it had become the symbol of the city. The following two centuries, however, witnessed a gradual decline in the city’s fortunes, due in large part to the strategic value of its location on the Meuse. In the latter part of the 17th century, Louis XIV’s wars caused the city to be repeatedly attacked and put to the sword, to the point that the frustrated inhabitants dismantled their own castle, source of their miseries, in 1715. A new fortress was built by the Dutch in 1818 at the same strategic location above the town. The 19th century was a period of relative prosperity based on the paper and other industries. The decline of heavy industry in the 20th century was felt here, as in other parts of Wallonia. Today, the city has started to prosper again, thanks in part to its tin products and tourist activity. In 1970 the Tihange Nuclear Power Station was built. Every seven years, a religious procession takes place in the so-called 'septennial festivities' in commemoration of the end of a drought in 1656. The last one took place on August 15, 2012. Huy is home to the finish of the La Flèche Wallonne (English: Walloon Arrow; Dutch: Waalse Pijl), an important 1-day cycling race held midweek in mid-April. The race traverses, and finishes, at the summit of the Mur de Huy (English: Wall of Huy), a climb of about 1 kilometer with an average gradient of 10%, with sections of 20%. Huy has also been used in the Tour de France four times: 1995, 2001, 2006 and 2015. Huy was used as a location for the first series of the 2014 BBC television drama series The Missing. Patrick Sarsfield, (1660 – 21 August 1693) 1st Earl of Lucan. Cavalry commander of Jacobite forces at the Siege of Limerick, Ireland, General in French Army following "Flight of the Wild Geese" is buried here, in the graveyard of St. Martin's Church. ^ Shankland, Tom (4 November 2014). "The Missing: Finding the location for a dark journey". BBC. Retrieved 7 October 2017. Wikimedia Commons has media related to Huy. This page was last edited on 20 February 2019, at 02:08 (UTC).